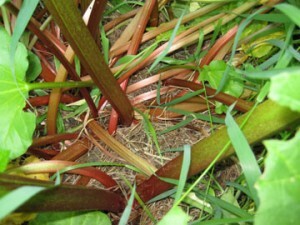 For my grand finale I thought I’d explore the word “rhubarb” as well as the plant. A friend recently asked me whether rhubarb didn’t have more than one meaning. I did a little research—and was he ever right! When you’ve said rhubarb, you’ve said a mouthful in more ways than one. Rhubarb, however, has so much personality that its figurative uses almost rival its culinary ones. Beyond its meaning as food, rhubarb is a theatrical phrase used by centuries of actors in crowd scenes. In Shakespeare’s day and beyond, extras onstage would intone “rhubarb, rhubarb, rhubarb” to simulate muttering, particularly angry muttering. I like to think that the peasants coming after the monster with torches in the classic film Frankenstein were using the word, although I have no proof of this. Perhaps because of its slightly harsh syllables rhubarb also connotes a fight, usually a spirited one. In the mid-20th century the word became attached to baseball. It was used most famously by colorful sportscaster Red Barber to describe an altercation on the field—between teams, between players and umpires, or between players and fans. Barber called Ebbets Field, home of the Brooklyn Dodgers, “the rhubarb patch.” Apparently, the Dodgers had a strong, tart flavor. The word also describes low-level aircraft strafing in time of war (at least it did during World War II). And it was used centuries ago as an adjective to mean bitter or tart. The OED also lists related words, including “rhubarber,” which refers to an actor milling around in a crowd scene. I asked its author, columnist John Fladd, where he got so many of his rhubarb uses, and he referred me to Eric Partridge’s Dictionary of Slang and Unconventional English. Partridge must have been particularly inspired by rhubarb for he found many meanings for the word. It has also connoted a loan, a bill for payment, an advance on one’s wages and an area in the country (as a synonym for “the Sticks”). I guess I live in the Rhubarbs. Before I hit the rhubarb myself, I guess I should tuck a recipe into this post. It comes from my friend and editor at the West County Independent, Virginia Ray. Preheat the oven to 400 degrees. 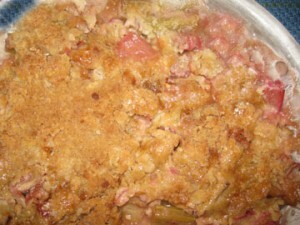 Place the rhubarb in a buttered Pyrex pie dish (a stainless or ceramic dish may be substituted, but don’t use aluminum as it will react with the rhubarb’s acidity). Sprinkle on the white/organic sugar and cinnamon. Sift the flour into a bowl. Add the butter and cut it in with knives or a pastry blender (your hands will do in a pinch). Add the brown sugar and mix again until crumbly. Sprinkle this mixture evenly over the rhubarb, pressing down lightly. Bake for 30 minutes or until golden brown and crisp. Serves 6 to 8. This crumble freezes well. This entry was posted on Monday, June 15th, 2009 at 4:00 am	and is filed under Crisps and Crumbles, Rhubarb. You can follow any responses to this entry through the RSS 2.0 feed. You can leave a response, or trackback from your own site. Nice! I loved this essay! I wonder did you see the what-looks-like-a-great recipe for rhubarb raspberry cobbler with cornmeal biscuits in last Wed’s NYTimes “Dining” section? I hope you can find it and test it out–looks awesome to me. Though I’m a great fan of “crumbles” too. Maybe you should do a little story about the differences between crumbles, cobblers, and brown bettys. My friend Thomas and I spent a whole rainy evening in Pudding Hollow last summer parsing that subject! I will definitely look for that recipe–nice combination! And I’ll ponder the definitions you suggest in the fall (a great time for those foods). Thank you………..
You’ve written: “as in the immortal Irving Berlin lyric, “I say it’s spinach and the hell with it!” Oy, enough with the Irving Berlin! The hell with it, that’s all! I was going to write that I’ll never have to refuse rhubarb again, now that there’s a stash of recipes for every rhubarb occasion, but the spinach and the broccoli … I love both EB White and Irving Berlin, but didn’t have a chronolgy, just a suspicion that one was probably referencing the other, if not pinching or even downright taking. I’m even more glad that I checked in!